This week got off to a strange start with a supposed list of leaked game titles circulating on Twitter and Japanese forums which included Sengoku Basara 5 for PlayStation 4. Even though the main games in the series tend to be announced well before they're actually released, it seems very early for Sengoku Basara 5 to be on the horizon. I guess we'll find out more about Capcom's future plans - and whether they include Sengoku Basara 5 in the near future or not - when Tokyo Game Show 2014 opens in a fortnight's time. In the meantime, here's some confirmed news! CafeReo have posted an update full of brand new Judge End goodies planned for October 2014. First up are the Sengoku Basara Judge End desk mats priced at ¥1,200 each. There are two different designs: 'Blue Sky' and 'Opening'. 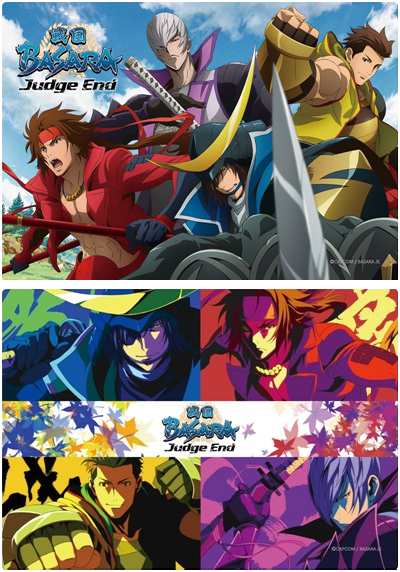 Next, a range of colourful Sengoku Basara Judge End book covers priced at ¥1,000 each. 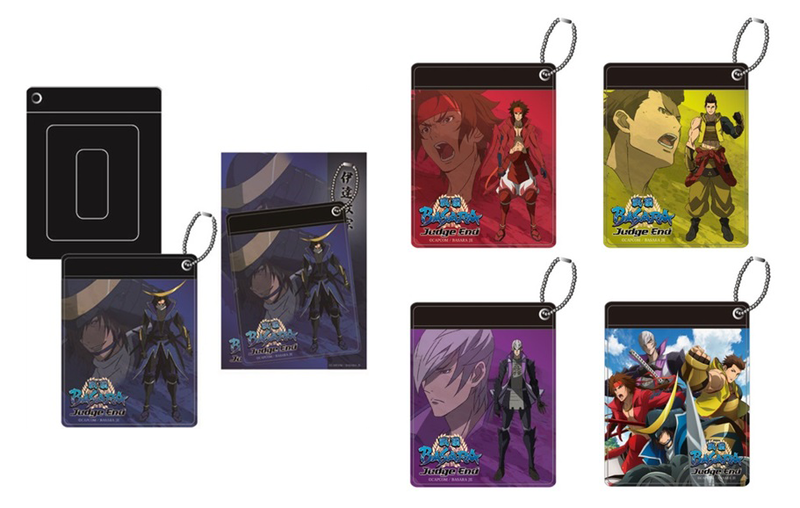 Finally, there's a selection Sengoku Basara Judge End colour pass cases costing ¥1,000 each. I don't have a compatible device so I can't check the new game out myself, but it looks reasonably fun. The Android spin-off went on sale on 1st September 2014 and it's priced at ¥1,500. Speaking of the slot machine series, the official soundtrack is now available on iTunes complete with its Kageyama Hironobu theme song for just ¥900. I'm listening to the previews now and they're not bad. The Sengoku Basara Judge End Original Soundtrack was officially released today in Japan and Amazon has added a full track list with samples of Tokuda Masahiro's score. I rather like it; the hectic action of the anime series often makes it hard to pay attention to the music but it's definitely growing on me. Here's a list of the tracks with mediocre translations in case they're useful to someone out there in the absence of anything better (I'm not poetic enough for this kind of thing). 3. Are you ready Guys? The soundtrack is also available on iTunes for those who prefer their music delivered digitally. To celebrate the release of the Sengoku Basara 4 Basara Matsuri 2014 ~Shinshun No Utage~ event DVD, seiyuu Okamoto Nobuhiko recently shared some of his thoughts about the game with the official Dengeki Girl's Style website. The content of the interview is slightly different to the one he gave in last week's Sengoku Basara Magazine so here are the new parts. Okamoto thinks that the appeal of the series is down to its flashy action and unique characters. Xavi Land is his favourite stage in Sengoku Basara 4. He assured the readers that even if they doubt that they'll be able to manage, it's actually very easy to learn to play the game. He gave some lighthearted tips to get the most out of Katsuie and asked them to try him out (lol). Okamoto thinks that Katsuie will appeal to the fans' maternal instincts since he starts out at rock bottom in the game and gradually finds hope. He'd like to see Katsuie interacting with Yukimura since their personalities are so completely different, and he'd also like to see whether Katsuie remains expressionless when being swung around by Oyakata-sama. His debut at the event back in January had made him nervous but he'd heard that Sengoku Basara fans were very warm, and that turned out to be true. Since fellow seiyuu Morita Masakazu always has a crazy Keiji-style hairstyle for the events, Okamoto wondered about trying a Katsuie-style wig next time. He once went to see a Butai Sengoku Basara stage play performance and was thrilled by the swordplay. Since he wouldn't be able to fight like that on stage himself, he thought it might be fun if future events have a segment where the seiyuu read their lines live alongside the stage play actors. There's apparently a third Okamoto interview about the event in the actual Dengeki Girl's Style magazine but I don't have that issue. The JE OST definitely has some nice tracks. I liked the Saika theme and some others first time I heard them. I want to get them as mp3's but my itunes account won't let my buy the Japanse store's songs though is that possible in some way? Katsuie's voice actor thought we'd get maternal instincts for his character? Not when you do such things to the Azai couple dude :( Those parts when he hangs out with Masamune and Sakon are great though. You need a Japanese iTunes account, which is easy enough to get but it requires purchasing iTunes point cards, which is a bit of a nuisance. I have a stash of iTunes credit since I use it quite a lot and the points cards are easy enough to obtain if you don't mind the extra hurdle to be allowed to pay. It's a shame Amazon Japan supposedly region locks its mp3 service as that would be a good option if it were available. I hoped that perhaps it was easier to buy from Japanese itunes now. Weird that in this day and age it's easy to import CDs as a foreigner but buying mp3's isn't ok.
Yeah my like of Oichi and Nagamasa makes me shake my fist at Katsuie! Dude what are you doing! At the same time he has positive aspects. Nice armour, looks cute, quite good to play as, VA is certainly not bad, gains sympathy from me when he moves on with his life. So, mixed feelings here.